Invoices are an important instrument used in day to day operations of the business which acts as an evidence of the transaction. In general, there are two types of invoices – tax and retail. Tax invoice may be understood as the invoice issued by one registered vendor to another, during sales. Conversely, a retail invoice also known as sale invoice is issued, the sale is made to the final consumer. The main purpose of issuing tax invoice is to avail input tax credit. On the other hand, the retail invoice is issued with an aim of requesting the customer to make payment for the goods delivered or services provided to him/her. While working on invoices of different kinds, one must know the difference between tax invoice and retail invoice. Meaning A tax invoice is an invoice issued by a registered dealer to the purchaser, showing the amount of tax payable. 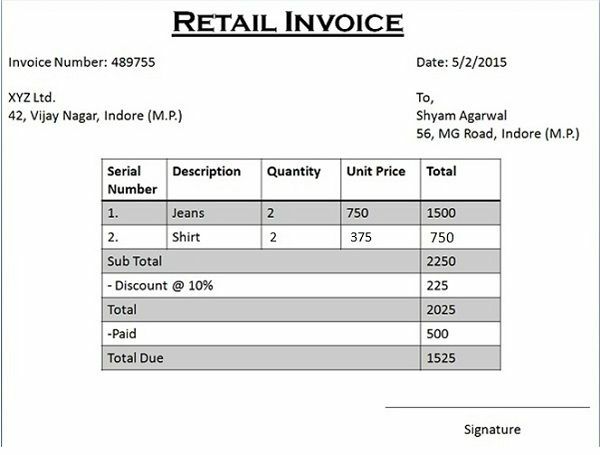 A retail invoice is an invoice issued by the seller to the buyer for the amount due against the goods sold to him. Issued when Goods are sold with the purpose of resale. Goods are sold to the ultimate consumer. A legal document issued by a registered dealer (seller) in the event of a sale, to another registered dealer (purchaser), who is not the consumer, is known as a tax invoice. The invoice should be created in triplicate i.e. original for the buyer, and the seller retains the rest two. Tax invoice plays a significant role in any country’s tax system as the dealer’s issue invoices, for recognizing a transaction. At the end of the financial year, they had to submit the details of these invoices to the relevant tax authorities. So, this is an important tool used by the government to avoid tax evasion. Date of issue of the invoice. A commercial instrument issued by the seller to the purchaser i.e. end user of the goods is known as Retail Invoice. The invoice is created in duplicate, i.e. original for the buyer and a copy for the seller. It is used to request for payment from the purchaser. The retail invoice can also be issued on account of interstate sales or sale to an unregistered dealer. Tax invoice implies an invoice prepared and issued by the registered dealer to the purchaser to show the amount of tax payable. As against this, the retail invoice is an invoice prepared and issued by the seller to the buyer showing the amount due to him against the goods sold. When goods are sold with the purpose of “resale” – tax invoice is issued, whereas when the goods are sold to the final consumer retail invoice is issued. Tax invoice is capable of availing input tax credit (credit on inputs, i.e. tax already paid at the time of purchase) as opposed to the retail invoice which is simply the request for payment. Tax invoice contains tax identification number of both purchaser and seller, but retail invoice contains the tax identification number of the seller only. Tax invoice is prepared in triplicate, wherein the original and duplicate copies remain with the purchaser and seller takes the third copy. On the contrary, the retail invoice is prepared in duplicate. 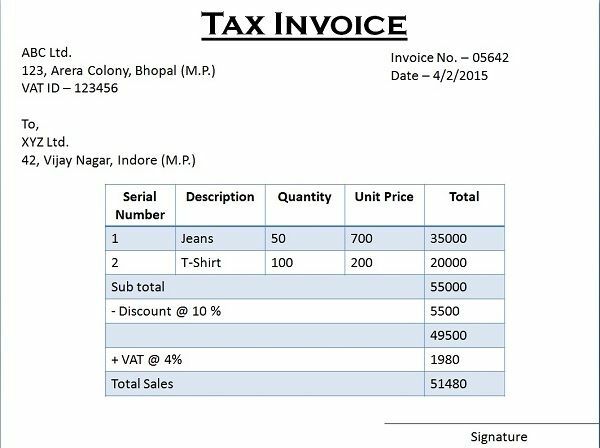 So, the above-mentioned points explain the differences between tax invoice and retail (sale) invoice, in a lucid way. It is the duty of every registered dealer to issue tax invoices at the time of sales. Here Registered dealer means the dealer who is registered under any tax ‘Act’ while if the dealer is not registered then, the retail invoice is issued to/by him. No, tax benefit is not available to the retail customers because it is issued at the time of sale to final consumer and not for the purpose of resale. What will happen if seller issue TAX invoice for the state in which he is not register for VAT. If seller is not registered, then the buyer will not be able to avail VAT credit. Really this note is good for new learners. Because it is quite simple to understand. After reading this article I know the difference between tax invoice and retail invoice. Thanks..
Nice explanation Mam….I will recommend my students to read this post.